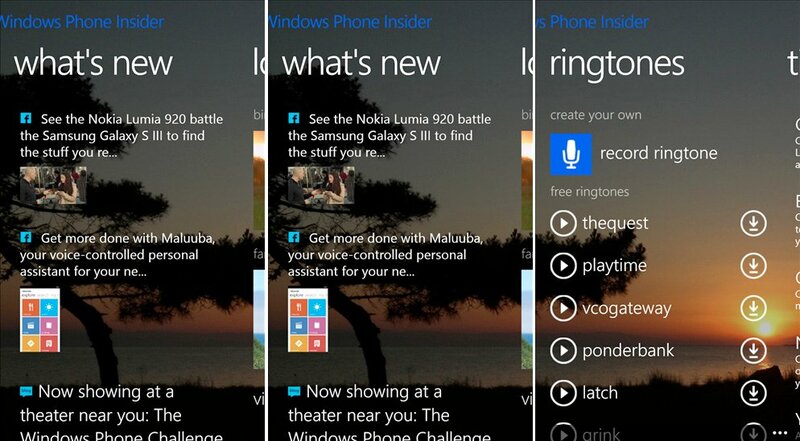 If you’ve been around the Windows Phone scene you’ve probably stumbled on the Insider app sometime in the past. It’s a sweet offering from the Windows Phone team that offers ringtones, wallpapers, and more. The app was previously at version 3.0.1.0, but we’re now seeing version 1.0.1.0. Is this a new Insider app? Signs point to yes, let’s check it out. Record your own ringtone: Record your favorite sound and easily set it as your ringtone. Exclusive ringtones: 5 new ringtones every month. Free lock screens: Enjoy Bing’s image of the day and Windows Phone fan photos. Submit your own! 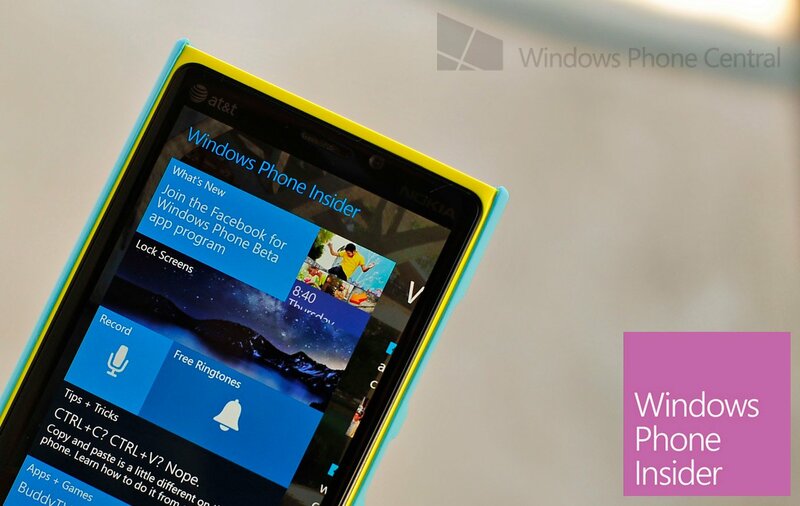 What’s new: Stay up to date with announcements from the official Windows Phone Blog and Facebook page. Apps + Games: 10 new recommendations every week, plus behind-the-scenes posts on favorite ones. Tips: Get bite-sized tips to learn how to better use your phone. Besides giving you media to customize your phone, Insider is also supposed to serve as an outlet for the official windows Phone blog and Facebook page. Unfortunately, if you want to read articles you’ll be kicked out of the app and sent to the web browser. Same applies for tips and tricks, out of the app and into IE. You’re in the minority if you want to hop around from app to app and it would have been nice to view the articles within the app itself. You can grab some images for your lockscreen from the app. The images come from two sources: Bing and fan submissions. Another mark against the app is the inability to let it take over your lockscreen. Instead you’ll need to manually download each image and set it as a single image for the lockscreen. Fast app resume? Nope. But hey, at least we have a double wide tile. The new coat of paint is nice, but it’s a bit of a letdown that an official app from Microsoft doesn’t take advantage of some of the awesome features of Windows Phone 8: Lockscreen support, fast app resume, voice commands, etc. The app is free and will slowly be showing up for you Windows Phone 8 users in the Store. The link for me shows the newer app, but Daniel and some other guys here at Windows Phone Central still only see the old app with the same link. Give it time to propagate across the Store and you’ll eventually see the ‘new’ version. 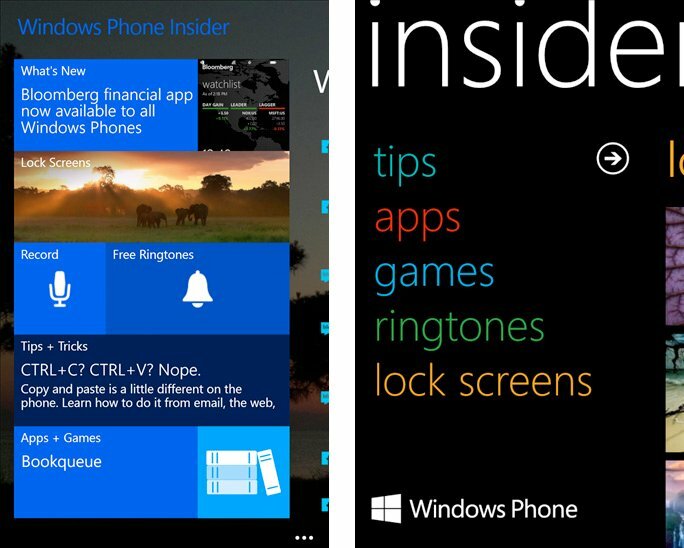 We also fired up our Lumia 900 and only see the old version of Insider available for it, sorry Windows Phone 7.x users. Grab it here in the Store, QR code below, or swipe to the right in our app.